These days, anyone finding a rum three decades old had better hold on to it, because they’re getting rarer all the time. As prices for the 1970s and 1980s rums climb past the fourth digit, locating one can be an equally fortunate and frustrating exercise…depending on how it turns out. 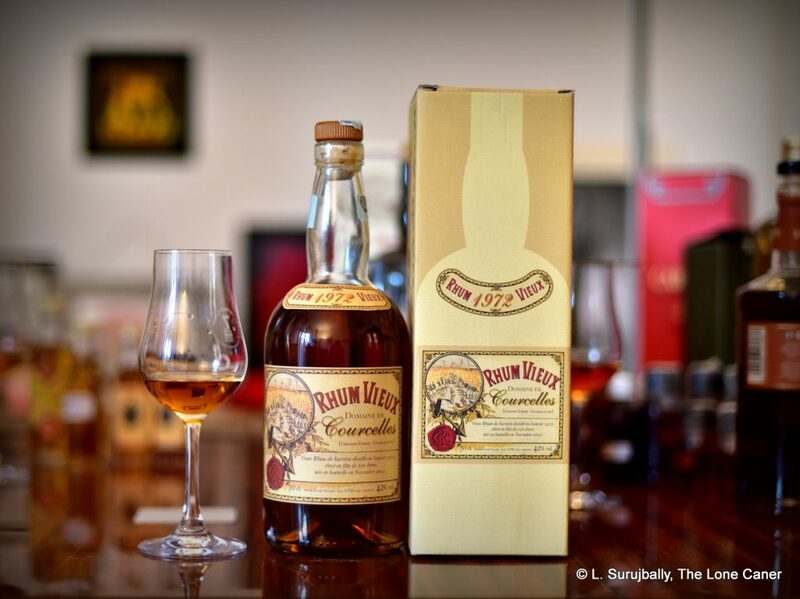 As to why Velier chose to issue two rums of the same distillation and aging dates, at two different strengths, well, we know he has done this before, most famously with the entire Caroni line and some of the pre-Age Demerara rums. Of course, it’s possible that Velier in this instance worked on the principle of taking a the entire outturn and bottling some at cask strength and the remainder at a more quaffable proof appealing to a broader audience. That’s reasonable, I guess (L’Esprit does the same) – yet although the 54% Courcelles 1972 and this 42% version share the same years, there’s a difference in that the 54% was laid to rest in steel vats for nearly two additional years, and both are referred to as the dernière distillation which suggests that a bunch of barrels were involved, each with its own peculiarities. And those peculiarities are important because they make this softer rhum individual on its own merits and different from its brawnier frere. Take the nose for example: it’s lovely and sweet, light without actually being delicate. It presents bags of light fruit – pears, ripe apples, watermelons, cherries – that go on forever, to which are added soft red-wine notes, honey, thyme and a drizzle of hot caramel on vanilla ice cream. In a way it reminds me a lot of the Savanna 15 Year Old Porto Finish from Reunion (haven’t written about this yet), but somewhat deeper even so, because the scents grow richer over time in spite of its relatively low proof point and their overall mildness. Tasting a rum like this is a mixed experience – one appreciates the subtlety, but strains to pick apart the notes. That said, it’s quite good, with lovely clear and clean notes of light fruitiness – pears again, watermelon again, some grapes, raisins and ripe mangoes, set off by softer nuances that speak of nougat, white chocolate, a flirt of coffee, rosemary, caramel, vanilla, thyme and some florals. It also has a background of honey that I quite enjoy with a profile like this because it strengthens the whole in a quiet kind of way, provides a bed for the rest of the flavours to emerge onto and do their thing. About the weakest point of the whole experience may be how it ends – the finish is short and faint, a zephyr following from a stiff breeze, with just some barely discernible floral and fruity hints and a bit of orange zest and tart yoghurt, and then it’s all over. After writing up my notes, I keep coming back to how differently it presents when rated against the 54% version – it’s like they are different branches from the tree, growing in different directions while still conforming to underlying and similar standards (many of the tasting components, for example, are quite similar). The 42% iteration, I have to somewhat reluctantly note, is less when placed next to its masterful stronger sibling. On its own, with nothing else to compare it to, it’s quietly, subtly brilliant and will not disappoint the casual drinker. But side by side, its potential clarion call is muted and dialled down, it is deferential and says much less…and when it does, it whispers. 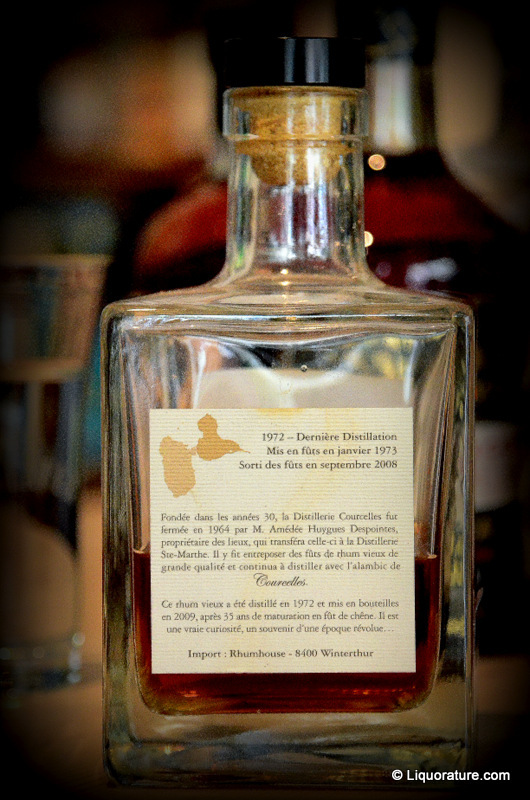 The Courcelles distillery in Grande Terre (one of the two “wings” of Guadeloupe island) was established in the 1930s and closed way back in 1964 when the then owner, M. Despointes, transferred the inventory and equipment to another distillery, that of Ste Marthe. 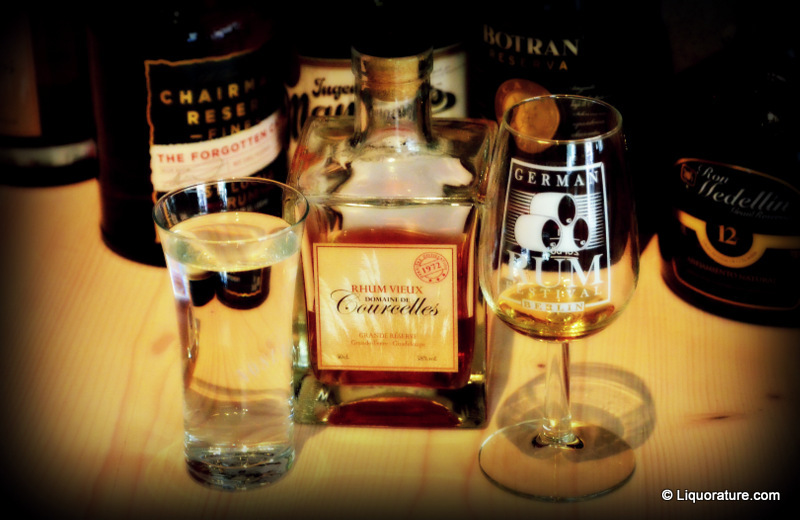 They continued using Courcelles’s pot still and distilled this rum in 1972. 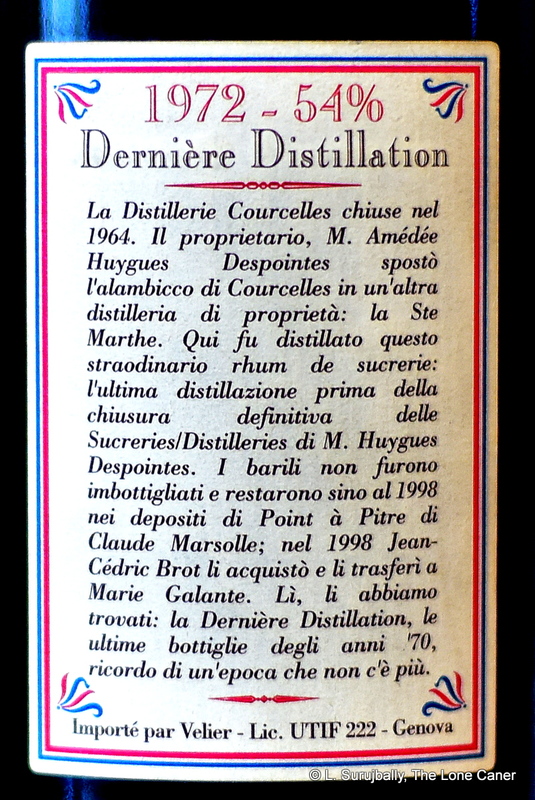 This is probably the last year any Courcelles distillate was made – I’ve never been able to find one produced more recently. The profile does not suggest an agricole, and since Guadeloupe is not AOC compliant, it probably derives from molasses. The taste certainly suggests it. About that strength differential – in my essay about the Age of the Demeraras, I remarked that the first three releases of Velier Demeraras were all issued at standard proofs because Luca was nervous about moving too fast with releasing >50% cask strength rums. I suspect that he had similar feelings about the 42% version of the Courcelles, which was why it was bottled first – two years later, just when he was putting out the full proof Skeldons in 2005, he went full bore with the rest of the Courcelles stock and never looked back. Velier’s star shone brightly in 2017, so much so that if you were following the October 2017 UK rumfest on Facebook, it almost seemed like they took over the joint and nothing else really mattered. Luca’s collaboration with Richard Seale of Foursquare over the last few years resulted the vigorous promotion of a new rum classification system, as well as the spectacular 2006 ten year old and the Triptych (with more to come); and for Velier’s 70th Anniversary – marked by events throughout the year – a whole raft of rums got issued from Jamaica, Barbados, St. Lucia, Guadeloupe, Mauritius, Japan….So much happened and so much got done that I had to re-issue an updated company biography, and that’s definitely a first. The Age of Velier’s Demeraras might be over and the Caronis might be on a decline as the stocks evaporate…but company is in no danger of becoming an also-ran anytime soon. Still, all these great rums aside, let us not forget some of the older, lesser known, more individual rums they put out the door, such as the Damoiseau 1980 and the Basseterre 1995 and 1997, some of the Papalins and Liberation series, the older Guyanese rums distributed at lesser proofs by Breitenstock…and this one which is on nobody’s must-have list except mine. 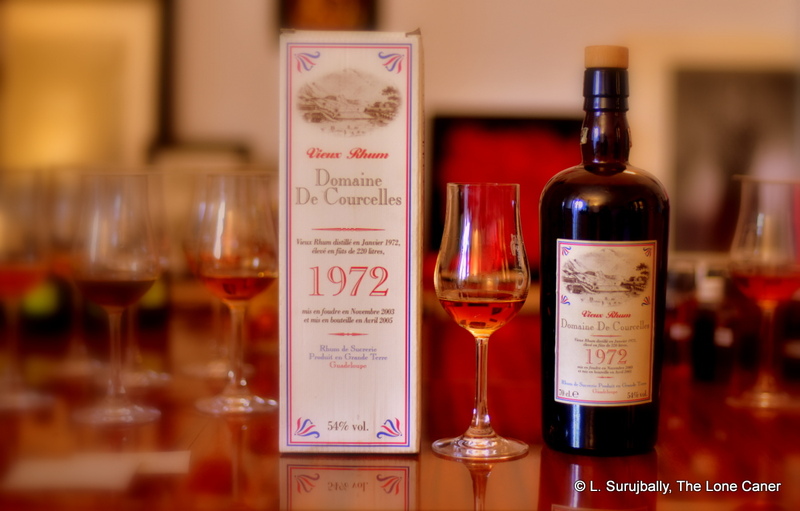 It holds a special place in my heart – not just because it was issued by Velier (thought this surely is part of it), but because the original Courcelles 1972 is the very rum that started my love affair with French island rhums and agricoles…so for sure this one had some pretty big shoes to try and fill. It filled them and then some. Reddish gold and at a robust 54% ABV (there’s another 42% version floating around) it started off with a beeswax, honey and smoke aroma, heavy and distinct, and segued into treacle, nougat, white chocolate and nuts. Not much of an agricole profile permeated its nose, and since it’s been observed before that since Guadeloupe – from which this hails – is not AOC controlled and uses molasses as often as juice for its rhums, the Courcelles could be either one. No matter: I loved it. Even after an hour or two, more scents kept emerging from the glass – caramel and a faint saltiness, aromatic flower-based hot tea, and just to add some edge, a fine line of mild orange zest ran through it all, well balanced and adding to the overall lusciousness of the product. The palate, which is where I spent most of my time, was excellent, though perhaps a little more restrained…some attention had to be paid here. The brutal aggro of a rum bottled at 60%-plus had been dialled back, pruned like a bonsai, and left a poem of artistry and taste behind: more honey, nougat, nutmeg, brown sugar water, and calming waves of shaved coconut and the warmth of well-polished old leather, cumin, and anise, with that same light vein of orange peel still making itself unobtrusively felt without destabilizing the experience. At the close, long and aromatic aromas simply continued the aforementioned and quietly wrapped up the show with final suggestions of rose tea, almonds, coconut and light fruit in a long, sweet and dry finish. Frankly, it was hard to see it being the same vintage as the Velier Courcelles 42% which was tried alongside it, and was better in every way – the 54% was an excellent strength for what was on display and I enjoyed every minute of it. There’s a streak of contrariness in my nature that seeks to resist flavour-of-the month rums that ascend to the heights of public opinion to the point where their makers can do no wrong and every issuance of a new expression is met with chirps of delight, holy cows and a rush to buy them all. But even with that in mind, quality is quality and skill is skill and when a rum is this good it cannot be ignored or snootily dismissed in an effort to provide “balance” in some kind of perverse reflex action good only for the personal ego. Velier, even when nobody knew of them, showed great market sense, great powers of selection and issued great rums, which is why they’re just about all collector’s items now. The Demeraras and Caronis and collaborations with other makers showed vision and gave us all fantastic rums to treasure…but here, from the dawn of Luca’s meteoric career, came a now-almost-forgotten and generally-overlooked rum that came close to breaking the scale altogether. It is one of the best rums from the French islands ever issued by an independent, a cornerstone of my experience with older rums from around the world…and hopefully, if you are fortunate enough to ever try it, yours. The Courcelles distillery in Grande Terre (one of the two “wings” of Guadeloupe island) was established in the 1930s and closed way back in 1964 when the then owner, M. Despointes, transferred the inventory and equipment to another distillery, that of Ste Marthe. They continued using Courcelles’s pot still and distilled this rum in 1972. This is probably the last year any Courcelles was made – I’ve never been able to find one made more recently. Distilled in 1972 and set to age in 220 liter barrels until 2003 when it was decanted into “dead” vats, and then bottled in 2005. I chose to call it a 31 year old, not a 33. The profile does not suggest an agricole, and since Guadeloupe is not AOC compliant, it may derive from molasses…or not. If anyone has definitive information or a link to settle the issue, please let me know. I’m not an avowed fanboy of agricoles: yet this one may be the best I’ve ever tried, and certainly among the top tier of rums made anywhere, by any method. Rare, old, powerful, excellent, pricey and, well … yeah it’s worth it. Holy sweet mother of God, where has this rum been sitting? A snarling, awesome 58% beefcake of an agricole (I have my suspicions about this, see below), aged 37 years and one of the best of its kind I’ve ever tasted. This is where I get up on my soapbox and demand that rum makers start going stronger, higher, more powerful, and move off from the self-imposed limit of 40% ABV. Just tasting this one would tell you how much more intense everything is when you dial it up a few notches. On my last day in Berlin in August 2012, I popped over to the Rum Depot and asked for whatever they had that was old, unique and preferably rare (this was on top of the eight rums I had already bought that were exceptional in their own way and unavailable in Canada). The co-manager (whose name I have regrettably not written down and have now forgotten, my apologies to the gentleman) trotted out this 500ml bottle from Guadeloupe from his personal stash, and purely on the strength of the tasting, I immediately bought the 47% version, which is the same age, but packing a shade less oomph in its trousers. The Rhum Vieux Domaine de Courcelles Grande Reserve was distilled in 1972 on the French Caribbean island of Guadeloupe (home of Karukera) and bottled in 2009, and let me tell you, it’s phenomenal. It did not have any AOC or terroire marked on the bottle – Guadeloupe has never been quite as intense as Martinique in getting the designation – but frankly, after a careful nosing and even more careful sip (or four), I didn’t give a damn. The amazingly strong (yet soft) nose billowed out at me without fuss or complaint, as assertive and friendly as an insistent St. Bernard coming to you over the snow to provide a well-needed dram. Scents of cinnamon, marzipan, breakfast spices and brown sugar melting in the tropical heat argued genteelly for attention, none dominant, none rough, none out of balance with any other. Indeed, I spent an inordinate amount of time simply nosing the thing, and even among all the other tastings I did that day, this was the one to which I continually returned. All these scents and more carried over to the palate of the medium bodied, straw-coloured rum. The marzipan almost mischievously flirted with turning into a minty flavor (but not quite, otherwise I might have been sourly muttering about toothpaste the way my Dad, the Hippie or the Maltmonster would), the cinnamon added nutmeg, brown sugar, honey and floral notes and for a 58% strength rum, the Grande Reserve was unbelievably deep and even a bit smooth – not without a little sting, mind, yet not raw or uncouth, not the bitchy scratch of rum-claws that made you hunt for your tonsils in Albania, more like the dark heat of strong, well-brewed tea. To call it glorious is to undersell it. It barks. It gurgles. It snarls. It loves you. It makes you shake your head and smile and thank whoever it was for inventing rums because this, by God, is what a rum should taste like. And the finish was nothing short of exceptional – long, lasting and mellow, with closing notes of warm ground after a fresh rain, a shade dry and with a last exclamation point of leather and pipe tobacco. The Courcelles distillery in Grande Terre (one of the two “wings” of Guadeloupe island) which was established in the 1930s when rum was in its heydey, closed way back in 1964 when the then owner, M. Despointes, transferred the inventory and equipment to another distillery, that of Ste Marthe. They continued using Courcelles’s pot still and distilled this rum in 1972 as noted above. What a shame there is so little of it to go around. Note my suspicion that this is not an agricole: even taking into account the pot still origin, it seems a little too heavy and flavourful to come from cane juice, and since Guadeloupe has a history of using rather more molasses than juice to make rum (unlike Martinique where the opposite is true), I feel my take is reasonable…feel free to point me right if you have evidence the the contrary, though. Premium or true vintage rums are a secondary enterprise for those who make them. Rums live and die at the mid-range and low-end, places and price-points that have never been welcoming to either old-timers or eccentrics. The hoi-polloi sneer at the past and don’t bother about the future, aimlessly seeking pleasure only in the amorphous now. Great and well-known legends in other genres have an easier go of it (like whiskies do), and gradually some older rums are finally getting their due. But no matter how reviewers like me flog the alternative, aged, unusual stuff, we know in our hearts that they will always represent a niche market, and be unappreciated by most – and if you doubt me, look no further than dusty Renegade rums gathering spiders webs of neglect in the liquor stores of Alberta. A rum like this shows up the weakness of that one-size fits all mentality, because if you think about it, rums made for “everybody” (and which sell by the truckload precisely because of that) are actually made for nobody in particular. On the other hand, rums about specific styles, with a complex palate done to exacting standards, with great blending, great artistry and (dare I say it?) great love … these are magical; they make no attempt to seduce us; they are serenely, happily themselves. 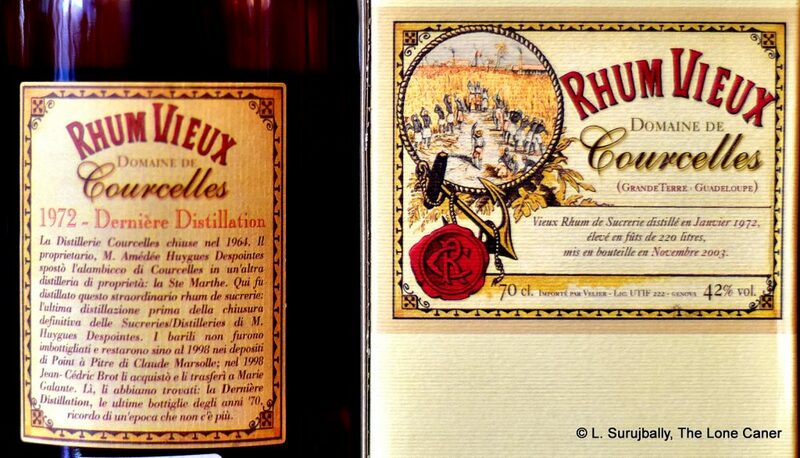 When you try the Rhum Vieux Domaine de Courcelles Grande Reserve 58% with its amazing profile, you’ll understand why it’s important we should agitate for more of such exceptionalism, even if it is just for the few remaining barrels of some long-defunct distillery that none but us rum lovers now recall.